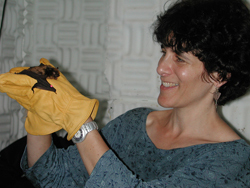 Professor Cynthia Moss (Psychology/ISR) and her Ph.D. student Kaushik Ghose (ISR Outstanding Graduate Student, 2004) have published an article in the Feb 8 edition of Journal of Neuroscience that indicates bats direct their beams of sound ahead of their flight, like a flashlight. By adjusting how sharply it follows its beam, the bat is able to adapt between "looking around" in a search mode and "homing in" in attack mode. The research was featured in a video segment on the Discovery Channel on Feb. 9. Related research has also been accepted for publication by PLoS Biology, a peer-reviewed, open-access journal published by the Public Library of Science. United Press International picked up Ellen Ternes' press release (see link below); the story has been published by physorg.com, Science Daily, M&C Science and Nature, and local news station WTOP, which picked up a story written by Jon Fogg of Capital News Service. It was also cited on the Faculty of 1000 Biology web site and in Germany's Die Stern newspaper (web site story in German, reprinted here).